This guide explains registration and usage of ILLiad, our electronic interlibrary loan service. ILLiad is a webpage for submitting interlibrary loan requests online. Copyright © 2017 Atlas Systems, Inc. All Rights Reserved. If you need further assistance, please contact the interlibrary loan office. 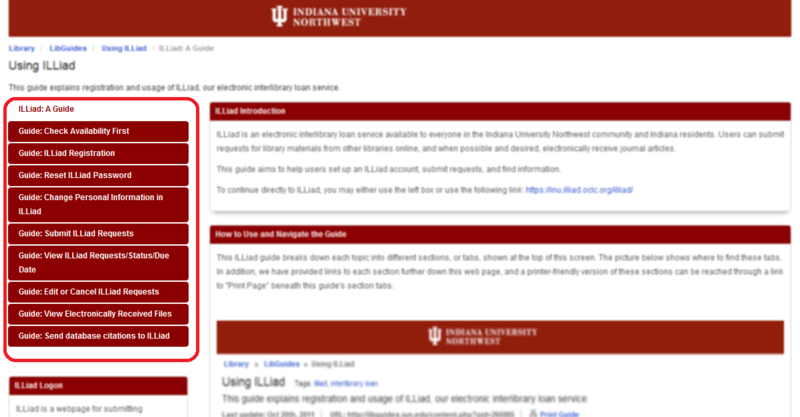 ILLiad is an electronic interlibrary loan service available to everyone in the Indiana University Northwest community and Indiana residents. Users can submit requests for library materials from other libraries online, and when possible and desired, electronically receive journal articles. This guide aims to help users set up an ILLiad account, submit requests, and find information. This ILLiad guide breaks down each topic into different sections, or tabs, shown at the left of this screen. The picture below shows where to find these tabs. In addition, we have provided links to each section further down this web page. Section for users to check if an item is already available at the John W. Anderson Library. Guide on how to create an ILLiad account. How to reset an ILLiad password when the users do not remember their passwords. How users can change their personal information as shown in ILLiad. How to submit an interlibrary loan request in ILLiad. How to view an interlibrary loan request submitted through ILLiad. How to edit or cancel an interlibrary loan request submitted through ILLiad. How to view an article received electronically as a PDF, if the library is able to provide the article in that format. How to send citations for an item from a database to ILLiad.